It was two in the morning when I closed the case. Sat in the dark of my room, surrounded by paper covered in pen-scrawled leads – ’Rome’, ‘Who is Eric?’, ‘The Rock’. I watched the credits roll, my mind still racing with the details of the murder. I realised I’d never played anything remotely like Her Story before and it’s given me something no other game ever has. 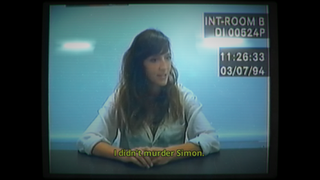 In Her Story you play an investigator searching through old police interviews to solve a murder. Back in June, 1994, Hannah Smith reported her husband, Simon, missing. Over the next month she was called in seven times by the police. Each of those interviews has been diced up into pertinent, transcribed, searchable clips which you must sift through to find the details of what happened and why. Her Story boots to an old, Nineties-style computer terminal. The database program is all ready and loaded with one word in the search bar: ‘MURDER’. Clicking ‘Search’ returns four clips from across the police investigation. The rest of the case is up to you. You have to listen to Hannah’s responses, picking out places, names, things – anything that might be a useful search term. Because all the clips have transcripts attached you can search for innocuous words, like ‘the’, or whole phrases, like ‘murder weapon’. In this way you direct the investigation. After just a few videos I’d a list of words I wanted to search and I worked through it crossing them off as I went. Each new clip turned up new lines of questioning. I found myself moving away from searching for what happened to why it happened. Trying to learn more about Hannah and Simon’s past. What’s most impressive is how, despite being non-linear, the plot unfolds like it was scripted; I discovered things in an order of my own choosing but I found twists leap out at me as though I were in a linear detective drama. I’ve spoken to other players who searched through the story by different routes and discovered things at different times who still felt like the story was crafted for them. This is largely down to the pairing of the game’s creator and writer Sam Barlow and Viva Seifert who plays Hannah. As you learn more about the characters and the events of the story you review clips you saw earlier in a whole new light. Things Hannah says go from being caring to calculating or from callous to loving. Barlow’s words hold the potential for multiple readings and Seifert performs in a way that encourages interpretation. It’s a wonderful pairing. One of the programs on your virtual desktop is a small database tracker that shows you how many clips are left unseen and where they fall chronologically in the whole. There’s more than 200 of these video fragments and I felt that if I could just find them all then I’d have an entire grasp on the story. A silly thought. That’s not to say this is an incomplete story, everything you need is there, but it’s like believing reading someone’s diary will give you a total understanding of them. It will give you the pieces you need to assemble a picture of them but you won’t have the whole. Her Story speaks to that human need to turn messy reality into neat plotted action. Life is seen and understood backwards, we construct events from fragments and assign them meaning all the time, here’s a game that encourages that human trait, relies on it. It’s enthralling. Her Story’s other undertow is a sense of voyeurism. The way the videos are filmed, the way you’re able to finger through them with searches of your choosing, the way she can’t see you watching: it’s compelling. Very occasionally, a bright light in the game world will light the screen of the in-game computer, and you’ll catch a glimpse of a reflection of yourself, your in-game character. It’s a subtle touch but it immediately grounds you as someone watching the lives of others. Her Story is a deeply intelligent game and there’s so much about it that I want to write about but doing so would spoil the story. Instead, if you’re at all interested in detective dramas, adventure games, or reading people’s diaries buy this game. Play it. Recommend it.